This effort models the relationship between mercury (Hg) levels in the common loon (Gavia immer) and land cover types as defined by the National Land Cover Database (NLCD). We constructed the model within the framework of a GIS to analyze the spatial relationships between land cover types and blood Hg levels in male common loons. Thiessan polygons were used to generate the territory for each loon. We created 150, 300, and 600-m buffers around the Thiessan polygons and modeled the relationships that existed in each distance class. 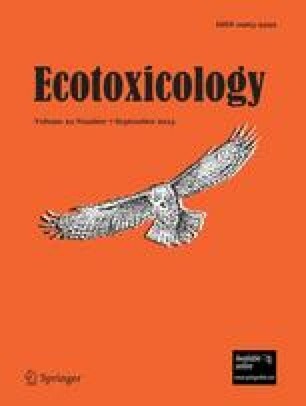 Within the 150-m buffer, three cover types, crop land, shrub land, and wetland were significantly related to blood Hg levels (r2 = 0.552, p < 0.001), which may indicate that the proximity of these cover types influences Hg availability in loon territories. Cropland exhibited a negative relationship with blood Hg levels and may play a role in reducing the amount of available Hg within the study area while wetlands and shrub lands exhibit a positive relationship. The study area consisted of five major lakes and eleven smaller ponds in northwest Maine, and data included a total of 61 male common loon blood Hg samples.